WW1 Reenactments Equipment : Great War Tommy WW1 Food Rations Labels : Cow brand Condensed Milk, pre-1917. 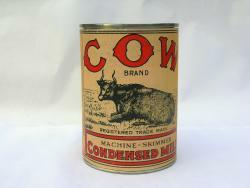 WW1 Reproductions and WW1 Reenactors Equipment / Kit - Cow brand Condensed Milk, pre-1917. "Cow" brand Condensed Milk, pre-1917. Condensed Milk label by R. Lehmann & Co, Ltd. of Monument St. London. E. C. Lehmann's were suppliers of Condensed Milk, Preserves and Provisions to H.M. Government. Label suits 10cm x 7cm diameter cans.